Today, we find ourselves on the precipice of the fourth industrial revolution. The way we’ve acquired and retained talent has shifted with each industrial revolution — think women taking on jobs outside the home in the second industrial revolution, or the new approaches to job searches in the third industrial revolution (CareerBuilder, Monster, and LinkedIn). 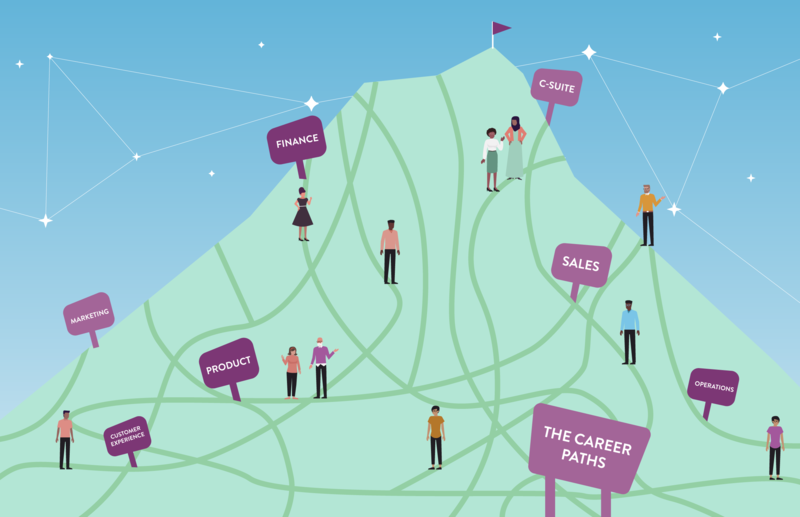 In the same way, “that’s the way it’s always been done” will no longer be a viable excuse to keep talent acquisition and management processes static in the future of work. That’s where a more nimble approach to talent — what many call “talent flow” — comes in. 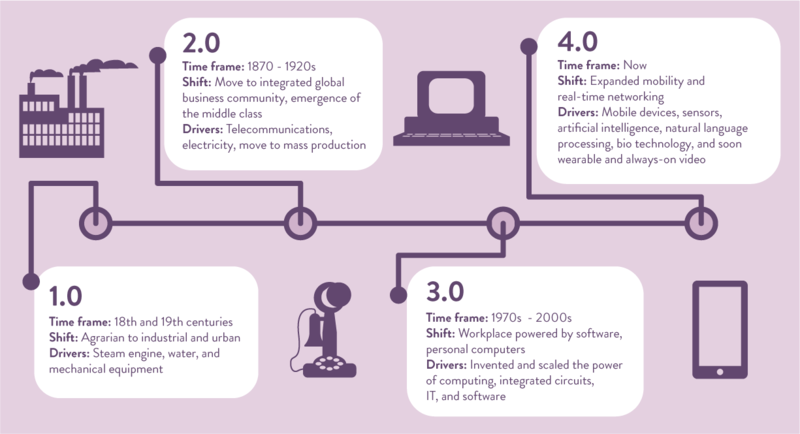 But first — what exactly can we expect from the fourth industrial revolution, and how is this transformation different? The fourth industrial revolution distinguishes itself from its predecessor revolutions because of the sheer speed at which it's happening. 65% of today’s primary school students will be applying for jobs that don’t exist yet! The progression of automation, artificial intelligence, and robotics are among the technological advances rapidly accelerating the need to rethink roles, responsibilities, and recruiting. The impact of artificial intelligence. The automation of jobs and its effect on the availability of human roles. Changing models for work and work structure (consider the surge in independent work, outsourced services, remote workers, and the gig economy). Availability of data (2.5 exabytes of data are produced every day over text, video, pictures, voice data streams and more). A shift away from traditional hierarchical structures to a more flexible, flat system. Growing inclusiveness of diverse job candidates. Increased focus on empowering and engaging employees instead of simply expecting decades of company loyalty. By the year 2034, 47% of today’s jobs will be automated. 6 of 10 current occupations have more than 30% of activities that are technically automatable. Automation could raise productivity growth globally by 0.8 to 1.4 percent annually. While there may be enough work to maintain full employment to 2030, the transitions will be very challenging. Between 400 million and 800 million individuals around the world could be displaced by automation and need to find new jobs by 2030. Of those displaced by automation, up to 375 million may need to switch occupational categories and learn new skills. If new roles we haven’t seen before are being created at the same rate (or even faster) than other jobs are being phased out, organizations will have two choices. One, let go of people in masses, and hire new people at an equal or greater rate — an absolute recruiting and resource management nightmare. Or two, organizations can keep talent internal, migrating people from dying jobs to new jobs. The way we currently manage talent, however, is not set up for such a transition. The winners and losers in this next industrial revolution will be determined by HR and how it can mobilize talent. CHROs are responsible for solving one of the greatest threats to an organization’s existence. Too many managers and executives have their heads down focusing on their own business unit; it will be up to talent professionals to see the bigger picture, predict which jobs will organically phase out, and make plans to move talent along unconventional career paths. Talent flow is a more organic approach to talent management. 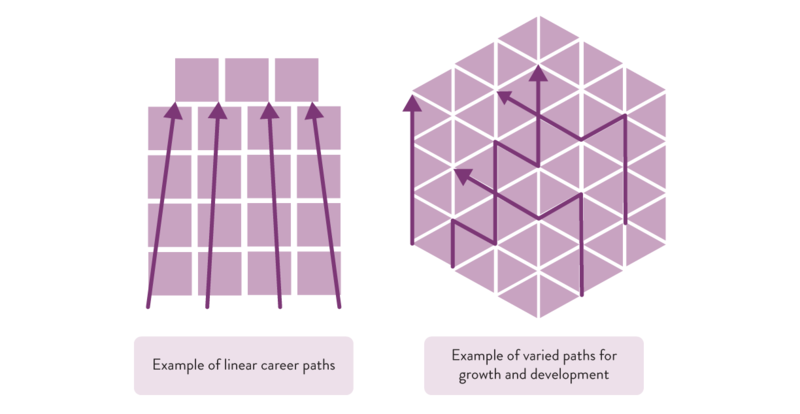 Think career lattices as opposed to career ladders. Rather than expecting decades of company loyalty from employees climbing the ladder in one department, companies must allow individuals to seamlessly move across the organization into roles that match their innate talents. How will this keep organizations agile? First, employees are satisfied because they avoid restlessness and get diverse work experiences (often in places they may not have expected) without having to leave the organization. Organizations also reap the benefits of these diverse work experiences, especially as these employees enter managerial positions and are able to understand the effects of decisions on multiple business units, and not just a singular department. Employees who understand all functions of a business can make smarter business decisions. Unfortunately, the way most organizations approach talent mobility today is pretty static and rigid. But it doesn’t have to be that way! Successfully implementing talent flow in your organization will require a universal and holistic approach to collecting and storing talent data. That may feel like a big leap, considering most business silos come with data silos. Don’t panic; we provide you with your next steps to develop a universal talent dataset that consists of predictive people data that can be leveraged in every business unit in our latest e-book, Talent and the Future of Work: The Essential Guide.